This month’s box is all about Heroes so it is full of hero beauty treats ready for the ‘back to school’ season. This month consists of 5 products, 1 of them being a full size make-up product, which you could pick what you wanted last month. 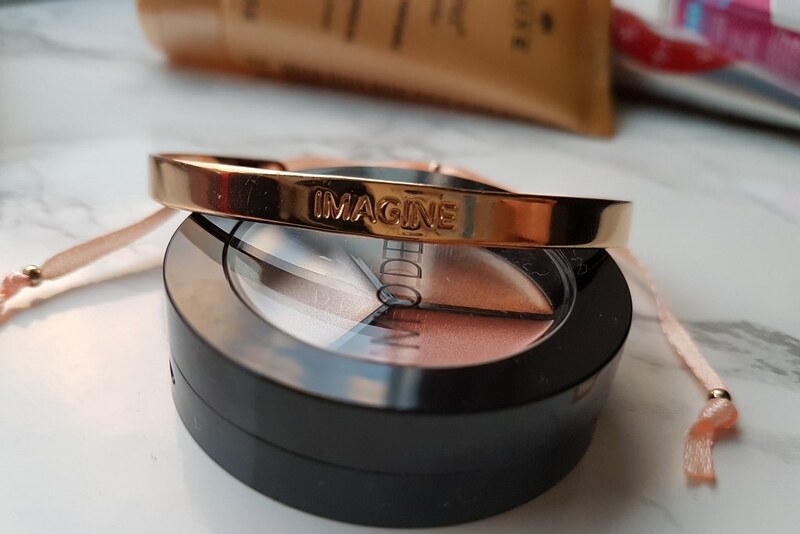 There was also an extra item if you have ever referred a friend to Birchbox, this was a really cute engraved bracelet which says ‘Imagine’. Instead of the typical box this month it was a draw-box again, which I love as I find these more useful. You can stack them up on your dressing-table and store your beauty products in them. Birchbox is a monthly beauty box subscription where you get 5 luxe beauty products and occasionally a lifestyle product as well. 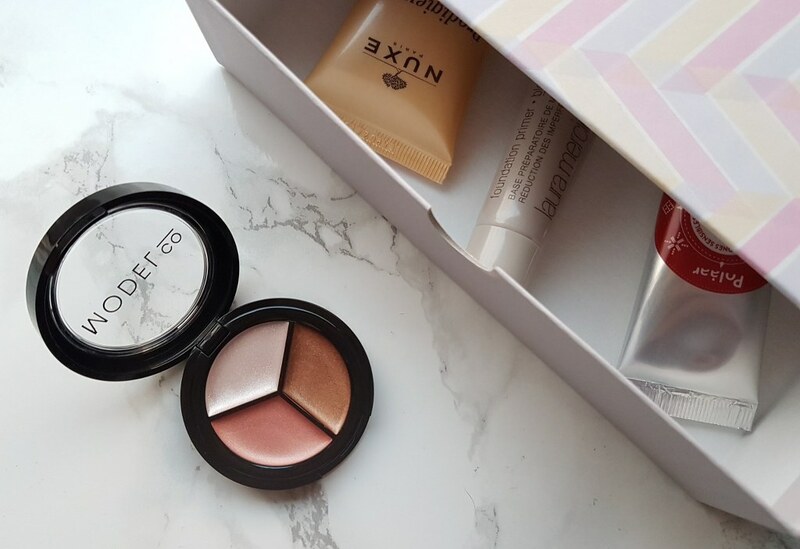 It is one of the more affordable beauty subscription boxes and they also have a fantastic and generous reward scheme. They also have a shop where you can purchase all the brands that have been featured in their boxes. This was the make-up product which I got to choose last month. You could either pick this or the ModelCo Creme Rouge for lips and cheeks. 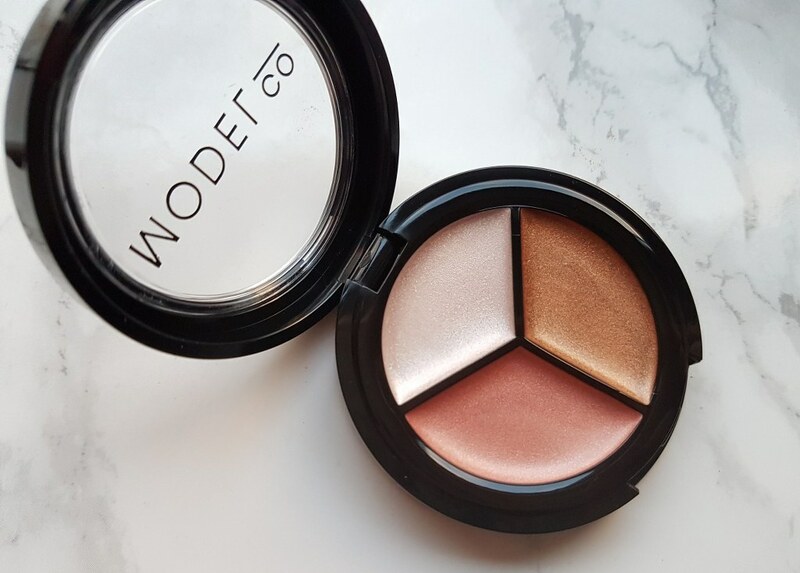 I am a big fan of highlighters at the moment so I really wanted to try this out and was looking forward to it being from the Aussie brand ModelCo. You get three radiance-enhancing creamy pigments which you can use on your cheekbones, brow bones and eyelids for an instant glow. I wish this product was slightly bigger so I could get my brush into it, but I could just use a smaller brush or my finger! I do think £17 maybe slightly pricey but it does apply to the skin very easily and gives such a gorgeous highlight than I am really loving this product. It doesn’t leave a greasy finish at all, it appears more like a powder and gives a velvet-soft finish even though it is a creme. I adore all the colours and this product will be getting a lot of use from me! 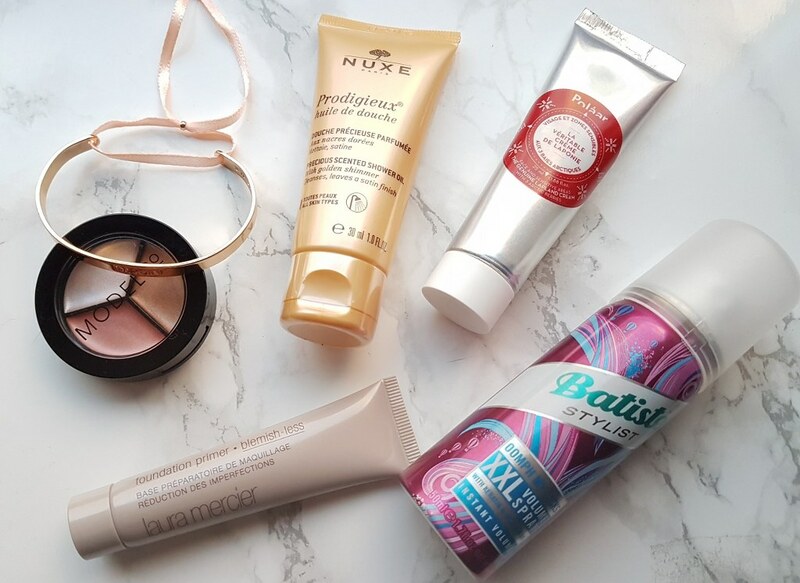 Batiste is usually known for their dry shampoos but it turns out they also know a thing or two about styling too! This volume spray is infused with keratin and inca inchi oil. This spray not only gives you extra volume in just one spritz, it also cares for your hair and defends against humidity at the same time! I don’t really use volume spray that often, but it is something I would take on holiday with me. I am loving the fact that it helps defend against humidity as my hair can be a bit Monica-esk (from Friends) when I am away! Trust me this is not a good look! So this will be really handy for me. I am a fan of the Laura Mercier Primers and I am so glad that I received this product in my box as I am in need of some more primer. This is a water-based gel that holds your foundation in place for longer while controlling breakthrough shine, and it also helps hide pores and blemishes as well! It is infused with salicylic acid (which is great for the treatment of acne) and the oil-free formula helps battle breakouts and creates a silky-smooth base for your make-up. I am hoping this lives up to what I am expecting and I can’t wait to give this a try! I really am happy with all the products I received this month and this one is no exception. This has the iconic Huile Prodigieuse scent, a delicate blend of orange blossom, magnolia, and vanilla. It really does smell amazing, I have the after-sun in this and absolutely love it! This skin-softening oil cleanses your skin and is brimming with sweet almond oil and golden shimmer to leave skin looking radiant. You massage it into damp skin and then simply rinse off! This product will also be great to take on holiday to give your tan that extra shimmer. I can’t wait to use this and smell amazing afterwards! This cream is a cult classic over in France and I hoping that I would get this in my box! The cream has a unique mix of three berries – arctic raspberries, cloudberries, and lingonberries and is an anti-oxidant rich lotion that will nourish, protect and pamper dry skin. This cream is rich in vitamins A, C, and E and it leaves behind a protective layer of hydration. Apply this morning and night, and when ever you need some extra hydration. This was a special bonus item for anyone who has referred a friend to Birchbox. It is a really pretty gold coloured engraved bracelet. Mine is engraved with the word ‘Imagine’ and has peach coloured ribbon attached. I think this bracelet if elegant and very wearable, I am made up with this bracelet and it is something I will definitely wear. I am really happy with this month’s box, I love every product I received. Birchbox did well with picking hero beauty products here as I am a fan of all the brands included in this month. Birchbox is great if you love to try products from well-known and loved brands, and if you love to discover new products. You too can get your hands on this bracelet as well as £5 worth of Birchbox points by signing up to Birchbox HERE. Ooh, I like the look of this box – may have to make a cheeky purchase! I love the Laura Mercier primer, but I like the look of both the bracelet and the Model Co highlighter trio! The Batiste XXL will really really volumise your hair! I use it all he time and love it for big boofy hair ( I have super fine hair). The bracelet is super cute!